don't you mean 49 years ago? So Walter White landed on the moon in 1999? I can see why he got to be so bitter after being demoted to a chemistry teacher after that. The Apollo 11 Moon landing was on July 20, 1969. I remember watching it on the carpet in front of my parent’s b&w tv. It was amazing as it made the Moon seem more real. I had the same feeling when a probe landed on a comet a few years back. You know you could touch the place if you could somehow travel far enough. It is “real” just like the top of a mountain or the Arctic. So 19 years ago today nothing of note happened? 49 years ago was the moon landing though. The Apollo 11 Moon landing was on July 20, 1969. I remember watching it on the carpet in front of my parent’s b&w tv. I remember watching it the exact same way, except my Dad had gotten us a color TV, the first one on the block, and all the neighbors were there also; adults in back on the couch and kids in front on the floor. Then everyone got quiet and Walter Cronkite told us all about it. It was great. Oops...don't know where that 19 came from. I'm getting old...I think my mind is fading a bit. Corrected. I've always wondered how they got the cameras on the moon. To make it perfectly clear, I am the absolute last person who would believe that the landings were faked, I'm simply curious as to how they got the cameras in place that they used. The camera was installed on the lunar lander on a fold out arm. In a way, it was like a selfie...but with the arm being mechanical and attached to the lunar lander. Edit: And, by the way, Mike Collins (the third astronaut in the Command Module orbiting above) was perhaps one of the few humans in the civilized world who did NOT get to see or hear Neil step onto the moon in real time. He was on the far side of the moon at the time Neil and Buzz made the exit....literally all alone and out of contact. Somewhat ironic if you think about it. The one guy THERE...in orbit....didn't get to see it or hear it as it happened. And speaking of cameras, there is an interesting control (speed of light) aspect on how they controlled the camera as it followed one of the top-half lunar module launches from the moon. The control was from mission control in Houston. However, the time lag between seeing the launch and commanding the camera was a few seconds...enough that one could not simply watch and track (the ultimate in lag is when the speed of light isn't fast enough). By the time you saw it, and moved the camera....it was gone. The controller in Houston actually had to begin the input to swivel the camera up in a smooth motion a few seconds before the countdown reached zero on the launch...so that the swivel command got there at the same time the LM launched. 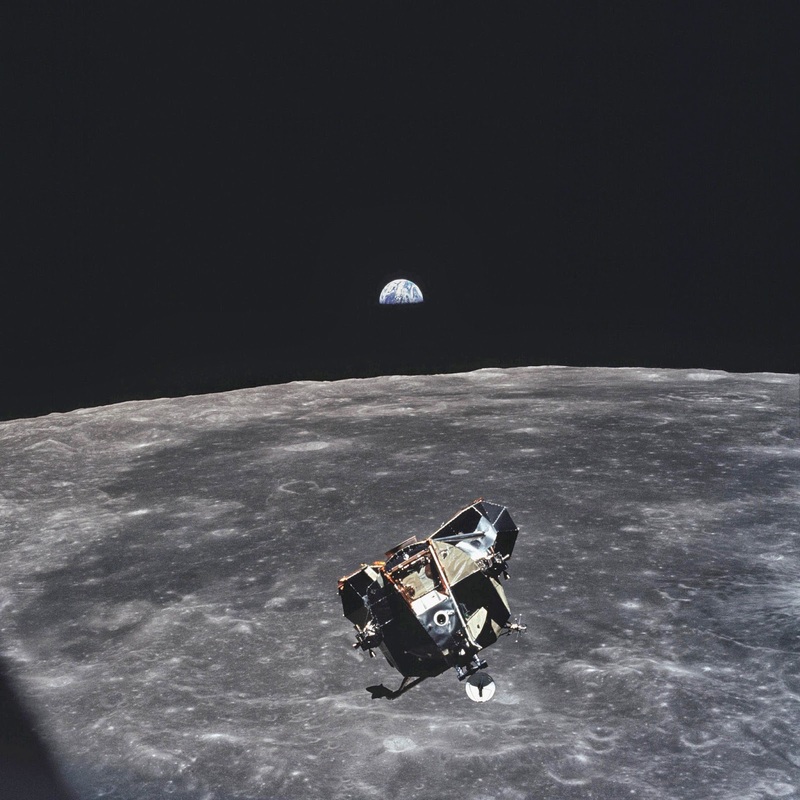 Mike Collins (the third astronaut in the Command Module orbiting above) was perhaps one of the few humans in the civilized world who did NOT get to see or hear Neil step onto the moon in real time. Every single human in existence, save one, is in the frame of this picture. Talk about being alone. Not alone...brought to you by....Soshi! Actually, all three lunanauts are behind the camera. Still, it's one of the greatest pictures ever taken. The Apollo 8 Earthrise is even more spectacular. I may have the wrong picture but one of those NASA photos showing the earth and moon was taken by the command module pilot and he was by himself. Oh, here it is; the other two are in the lunar module. Every single human, dead or alive, other than the photographer, is in the frame of this picture. Funny things you learn in space that you don't anticipate on the ground. Don't do a urine dump just prior to a sextant reading. The urine crystallizes and sparkles, making it difficult to locate the star for the sextant reading.